We are pleased to welcome you to the first edition of this newsletter FOCUS Quarterly. At FOCUS, we know that military children and families are resilient and hopeful, but that at times the wear and tear of military life, including multiple deployments, can challenge a family. FOCUS provides resiliency training to strengthen family skills and assists parents in problem solving, communicating and co-parenting at a distance. 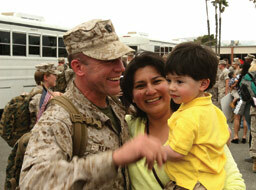 FOCUS Quarterly provides military families and children relevant and timely resiliency skills, tips, and information. In each edition, you can expect to find articles about common reactions to deployment and strategies to meet the changing needs of military children and families. Helpful resources for parents will be spotlighted in the For Those in the Know column. Each edition will also contain a Faces of FOCUS column introducing you to one of our site staff and sharing his or her experiences and thoughts about military family life. In addition there will be a FOCUS On column which will introduce a helpful skill and then provide a few activities to teach and reinforce the skill with children of various ages. With a debut during Military Family Month, we designed the current issue of FOCUS Quarterly to address some of the challenges that many military families face when navigating the stresses of the holiday season. You will find an article entitled “Maintaining Cheer throughout the Holidays” that discusses common child reactions during the holidays and provides tips for navigating challenges. A second article, “Snappy Self-Care Solutions,” provides strategies for self-care -- as the leader of your family, you will need to fill yourself up in order continue giving so much to others throughout the holiday season. You will also find an activity to help children of all ages learn to relax and calm down during what can be a very chaotic time of holiday festivities. Finally, For Those in the Know will highlight the importance of reading and will introduce two amazingly helpful and fun resources for your entire family (hint: they also make great holiday gifts). It is with sincere gratitude for your service to our Country, that we bring you this inaugural edition of FOCUS Quarterly. We wish you and your family a wonderful holiday season. As every teacher and parent knows, no two children are the same and their reactions to each and every life event can vary. That is part of what makes parenting fun, but at times can make it seem overwhelming. This can be especially true during the holiday season when so many other things are demanding your attention. While every child is unique, there are some common developmental stages that affect the way children react to the world, and by being aware of some of these common stages it can help to make holiday planning simpler. You know that self-care is important for your well-being, that it makes you healthier and stronger. You really like the idea of “time for yourself” and yet it never happens. Why? For most, the culprit is lack of time. Your dream of walking miles along the shoreline or enjoying a good movie just doesn’t fit between work, soccer carpool, dance class, dinner, and homework. That’s why our goal in this article is to brainstorm ways for you to fit “you time” into a season that’s all about others. If you can figure out how to take care of yourself during the holidays, continuing to do so into the new year will be a SNAP! When children are sad, mad, angry or even frustrated they sometimes don’t realize how much it can affect them physically. Strong feelings can look and feel different for each child. When going through daily life children often have physical reactions in their bodies and thoughts about situations they encounter. How a child responds, reacts, or behaves is often a result of what they are feeling and thinking at the time. Many events or daily activities can intensify and get more complex around the holidays. This is especially true for military children dealing with a parent being gone during that time. During deployments, parents and other caregivers are also coping with loved ones being gone, which can be very challenging. Understanding feelings and finding helpful ways to cope is important for both parents and children. FOCUS provides several tools that can be used to help children calm their bodies during stressful times. 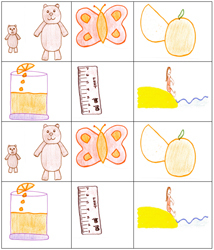 One of these tools is progressive muscle relaxation for children. Progressive muscle relaxation is a technique used to help children manage the physical effects of their feelings. When a child is stressed he or she could physically experience headaches, stomach aches, clenching of the fists or teeth, muscle tension and much more. Progressive muscle relaxation provides children the ability to relax their bodies when stress becomes physically overwhelming. The FOCUS Progressive Muscle Relaxation script (included in this newsletter) starts with deep breathing. Then it takes the child on a journey through their body, focusing on each specific muscle group by tensing and relaxing the muscles. The script tells a fun story that engages children and helps them to experience relaxation more fully. For example, kids are instructed to squeeze pretend oranges to help them tense and release their fists and arms. When they imagine drinking the juice, it is very sour so they have to tense and release their jaws. There are scenarios that move throughout the body. In the end, children feel calm and relaxed. Parents often feel refreshed too. The FOCUS Progressive Muscle Relaxation script teaches children that even when they are tense or stressed they can relax their bodies and calm down. FOCUS would like to offer our thanks to all Service Members and their families for the incredible sacrifices you make each and every day. For information and resources on how your installation or community can celebrate Military Family Month check out Military Homefront or the Armed Services YMCA Military Family Month site. United Through Reading® is a non-profit organization founded in 1989. Its mission is to unite families facing physical separation by facilitating the bonding experience of reading aloud together. United Through Reading® has three programs: Transitions, Grandparents and Military. All 3 programs assist families dealing with separation by providing a platform for parents and grandparents to read to their children. 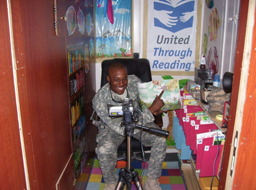 United Through Reading® Military Program provides deployed service members the ability to record a reading of a children’s book aloud along with special, individualized messages for their children at home. Children at home then watch the DVD of the recorded book reading and can follow along with their own copy of the same book (if available). Recording locations are hosted at select USO locations and sponsored by participating commands and units. You Are Never Far Away is a personalized children’s book that deals with deployments and separations in military families. The book can be personalized by service branch, child’s name, service member’s name, location, and child’s photo. Personalized books can help maintain children’s interest in reading and support literacy and learning. This unique book for military families also supports connection and parenting at a distance.